For more than 100 years, G.A. 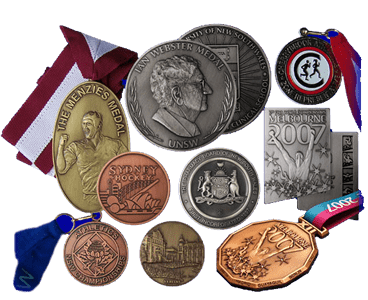 Millers have been supplying Australian schools, sporting organisations and businesses with custom medals, badges and promotional items. We work with you to develop custom designs to meet your needs, with in-house designers to collaborate on your artwork. We provide an extensive selection of materials and finishes, so you can create an end-product that your recipients will be proud to wear. We provide a realistic estimation of production and delivery times that are based on your specific product, material and finish. Our school custom title bars were a big hit with the students. Thanks for the great service. Australian Canoeing would like to thank you and the team at GA Miller for your work on our Hall of Fame medals. We know it was a mammoth task to complete and you were able to pull it off for us. The medals look great and thank you again. I just wanted to send you a note of thanks. The volunteer years of service badges were delivered this afternoon. They look fantastic. We are very pleased. Thank you so much for your assistance and advice throughout the design process. Much appreciated! A huge big THANK YOU for all of your efforts, You have made this process very easy for a novice in purchasing badges like me. The badges were a big hit and all of the staff loved their gifts from the hospital and I did have several staff mention how excellent the badges looked. Everyone loved the car badges, they were a huge success. Thank you for your time and patience. Medals arrived and look excellent, exactly what you promised. We also really do appreciate the way that you have grouped them in their classes. Just a quick message to say thank you for our badges. They arrived today and I am so pleased with the outcome. They are very professional and exactly what I was after! Medals have arrived, they are awesome. The kids are going to love them. They really are a Wangaratta exclusive medal, that makes a big statement for our centre. As always your "can-do" service is really appreciated; and is exceptional.